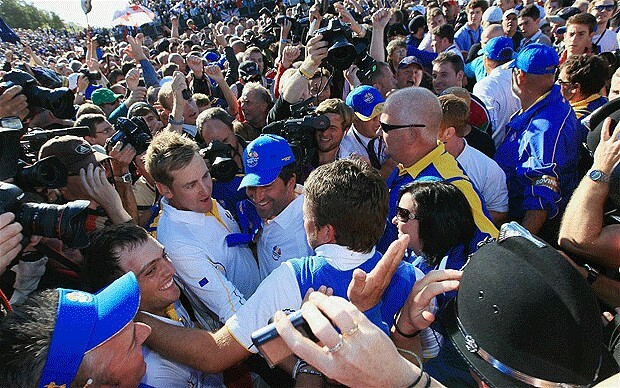 Why is the Ryder Cup banning its spectators from sharing pictures from the event? For the 40th Ryder Cup 2014 held on the PGA Centenary Course at the Gleneagles Hotel in Perthshire, Scotland, a new rule was introduced for its spectators. Organisers of the Ryder Cup put a ban on the act of uploading photographs, videos and audio files of the event on social media. The reasons sited by the PGA for this rule was that the act of picture taking and sharing was distracting for the golf players taking part, and that the players needed this rule to make sure that their image rights were kept intact. If the spectator was found breaking that rule, their phone or device would be confiscated and returned to them at the end of the day. When I heard this for the first time I thought it was a little silly, like a private school that confiscated the phones of their students that were found texting in the middle of class. In an interview with the Telegraph, Social media expert Professor Sarah Pedersen said the regulation may be difficult to enforce. “There are always going to be people who want to break the law. It is something we will see an increase in. There are all sorts of reasons behind this, to do with sponsorship. There is also a ban on mobility scooters and autograph taking. 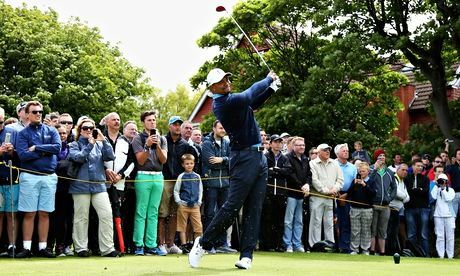 During The Open 2014, Tiger Woods complained about being distracted by the trigger happy fans following his game through the first round. He was a little more understanding than the school-like rule of ‘do not use or we will confiscate’. “People were taking pictures – like we had it all day today. There was a lot of cameras out there. We were backing off a lot of shots and a lot of people moving around. It was tough. Unfortunately people just don’t put their phones on silent or some of the professionals guys were getting on the trigger a little early. Could this be a simpler solution to the Ryder Cup spokesperson’s statement? Mobile image technology has come a long way. National Geographic photographers are using their phones phone for professional photography as well. Take this link for example. “We want to make you aware of an update to our Club policy regarding home matches. Supporters cannot bring large electronic devices (bigger than 150mmx100mm) inside the stadium. For example, iPads or other tablet devices and laptops are now prohibited. Also please be aware that large bags, large cameras and liquids (with the exception of a small bottle of water with the top removed) are included in our list of prohibited items. In essence it is their attempt to protect the sponsors and their image, worried that supporters may record large sections of the match. As technology and connectivity keeps getting better and better year on year, could we eventually see certain mobile devices being banned from stadiums all together? That doesn’t seem the universal approach as social media sharing is something that many sport brands promote and utilise to build popularity, awareness of campaigns, etc. that all eventually contribute to them making more money. So where does one draw the line? Protecting the sport from pirates feels like a long shot. Instead should there be more of a “if you can’t beat them, join ’em” approach? For example, switch phones to silent mode and promoting the sharing of a brand’s hashtag with images on social media (crowdsourcing contribute to sponsor campaign). Nothing is a sure-shot at the moment. The involvement of spectators that have increasingly powerful devices in their pockets at sporting events will change over the next few years. To know which direction we go in next, we will have to wait and see.